This is the trap map of our most beloved mission to run, be it trio, duo or solo (at least it is mine): Flamethrower. There are no bells and whistles, simply forward and kill. Don’t forget to take the side quest from Odysseus in Hissarlik Hill for it (“Kill Polydamas”). It resets weekly on Thursday. Update 2012-05-18: Included video of Fritz, lvl 125 musician main, doing Flamethrower. If you play a cannon main, this is a mission where it shines brillantly. Take out the Evil Arachnoids (big cannons, not many hp, but awful aoe) carefully. Increasing range is quite important here. Take out the summon portals over the wall. And then watch a video of a poor melee main and see how messy he is coerced to do it. Harhar. 1. Destroy the Evil Arachnoid to the right. 2. Destroy the summon portal. 3. Disarm the net traps at gate with one scroll, scrolling as indicated at “x”. 4. Destroy the Evil Arachnoid to the left. 5. Destroy all remaining monsters the summon portal has produced. After that, position your sethed gunner close to the north side of the wall so that he targets the flamethrower at the right side of the Frightful Slaughterer’s band. Then kill it (the flamethrower). When the Frightful Slaughterer and his remaining minions storm at you, you should be able to apply devastation shell to them all (or nearly all) and kill the mini boss in one, at most two shots. Remember: use the double-turn feature wisely. Kill the mini-boss in your last activation so that you can kill as much of his company before it and then get another free turn to wipe out the rest. 1. When you scroll at the “x”-marked location you can destroy two traps at once. See Fu’s comment on this for more detailed information. 2. At the spot marked “WoL” is a little hut. If you destroy it you get five Water Of Life potions. 3. When you approach the gate in D/E11, don’t enter the 3rd grid row, counted from the wall (see picture above). Approach to the fourth row and then dash to the gate itself (don’t forget: there is a net trap to disarm). This way you skip the three flamethrowers which will spawn otherwise. Not that it greatly matters for me but in lower levels they add to the mob pressure which can be bad. Thanks to Fu for his comment; I updated this entry and the map accordingly. ← How Many Hackneys For An Elephant? D6 (The first barrier). Use scroll in front of the barrier. There is net trap to the right as well as to the left. C8 – Flame trap, can be ignored. B/C9 (The second barrier). Use scroll at the wall next to the gap. b – barrier, g – gap, w – wall, use the scroll in front (south) of this wall. 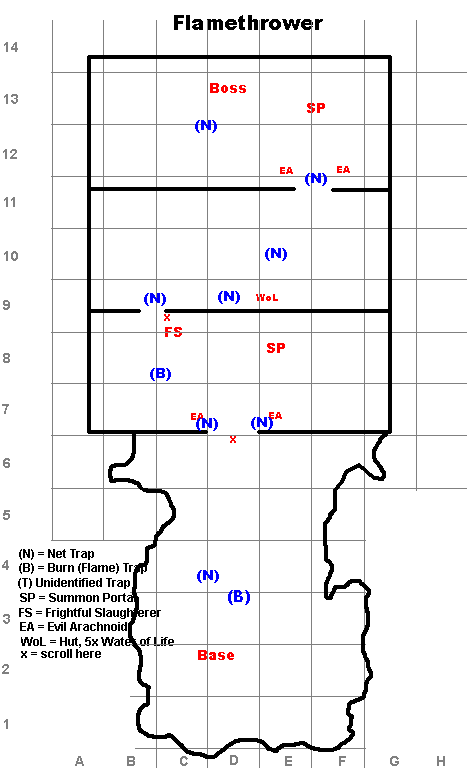 There is a final net trap at approximately of C/D and 12/13 (just behind the final arachne). Meaningless/can be ignored though. Total scrolls used – 5. Final boss spawns with 2 spears to the south of him and 2 horse gunners further away to the south west. As much as I’ve seen there’s also a flame trap at D3-D4ish. Got in it once with the cata because I forgot to scroll the first net trap. Any confirmation on it? Pretty sure it’s D4. Just did my very first solo run of FT, and ran across the trap there. Wow, ran that at least 100 times and didn’t experience that trap. To be honest, I scroll automatically and probably disarm both traps. My main (the sword main) triggered the net trap, my ora got the flame trap. I usually enter second, so I’m starting in the middle and can get both traps by scrolling just before the tiny ramp. The old upgrade system made it easy to get to the scroll spot, the new one makes you run 1-2 squares too far. Confirmed too the Burning trap at D11 as vain said…. That must be a new one. I always roam there and I never got hit by a trap in these squares. But I must admit that I did not run that mission since Africa came out. I didn’t find any new trap there and walked around pretty every square in the starting area after the patch. I ran into the initial net trap, yes, but not into any other trap that I didn’t know about. are you making a video of FT with fritz too :D? Yes, but it will take a while. During the christmas craze I had only time to play Claudia. Fritz is still at lvl 119. No, just no. This should be a 10 in difficulty, at least for my level 125 canon main. I brought the main, the gun, and the seth’s will slinger. I used energizer title, blessing license, Nouvelle Cuisine feast, high level guild buffs. I used full +1 / 2 / 3 DG, mount, clothes etc. I used +7 DG weapons bought from coupons. I had all five upgrades bought and catapult and gunner sethed. So I use Deva shell, sethed cata, sethed gunner, and oracle attack. That is enough to take out ONE mob. Then four invisible mobs gank you. So I fought my way to the first mini boss, after destroying the first summons portal. The mini boss has about 8 mobs around it. 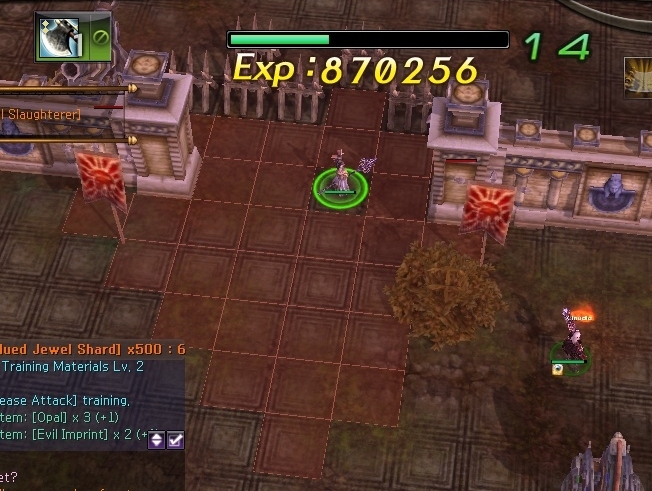 Considering it takes sethed catapult, gun, deva, and oracle to kill one mob, its just game over. and it seems flamethrower can shoot over the wall to kill catapult…really? I’m not saying it’s impossible, I am saying you have to take it seriously. It’s not really that hard… and personally I find it weird that you’re having that much problems with the gear you had… +7 DG on a sethed cannon main should be enough… what was the gunner you were using? stanced jani or sheriff? 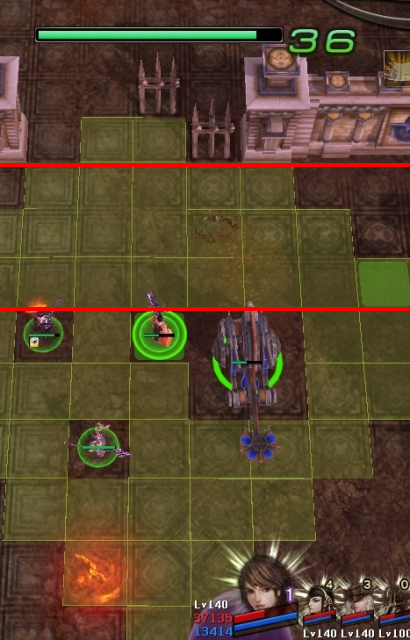 Regarding the invisible mobs, if you’re level 125 you should know that it can be easily avoided by walking before attacking. It only happens when you click to attack and merc/main auto-moves (clearing some fog of war where no enemies will be placed and thus enabling “invisible mobs). There is one trick to kill Arachnes. They have either very small range or very small sight and your cata cat easily bombard them from far away without them taking hit on it. The best part is, those barricades that are supposed to block you are actually blocking them, so they can’t come closer to get in range. I usually just pull everything that’s villing to come to me from far away (max gunner range), kill everything that comes closer and then my cata easily destroys helpless arachnes. My fiance and I tried this the moment he hit 125. He was bow(m)+vamp (he insisted on taking his vamp, don’t ask why)+sorceress, and I’m music(m)+ora+jani(was torn between him and the sheriff–the level of the jani was the deciding factor). We beat it without much incident, however, I can’t help but to think if my cannoneer would have been a better choice. Yes, we had a catapult, but you’re right–a cannon main shines here because these things are nasty if you get too close and it’d just be best to kill it from afar. Things died all the same, and I’m thinking about testing out the cannoneer theory tomorrow. While a cannon main is great, the cannon mercenaries are not. I doubt that mounts and decoration are the deciding factor (at least in higher levels) but in the end I can only support Senex: cannon main good, cannon merc bad. For TBS that is. I tried to use a druid in several missions – I was not convinced. His damage isn’t that great. An oracle can tank better in most situations because the danger is not the physical attack but the magical one, and there the oracle shines. And with a proper staff she can attack not too badly. Druid is a support to be honest in most tbs. A beast soul helps tremendously till people get better gear and aven though druid is an expensive merc – it is still far cheaper than even a single +10 weapon – and oyu only need BS even a level 1 FP is fine. nota big deal to skip that spell for tbs reason. A catapult under only seth rarely one hits a whole mob group while adding BS makes it a sure job even without the upgrades. Till attila came I usually advised druid for anyone lower level to invest into and none of them ever regreted. +3k-ish damage with charms on the whole party and the catapult is a lot – just think of it as a +8 enhancement on even a pegasus cannon – really hard to compare it with lower level gear. But the drawbacks are… yea the merc is fragile and does minuscule harm even under his own buff. After you get good gear a sheriff or attila helps a lot more (I love attila+oracle formation with my cannon main) but at the lower levels even up to 136 I would say he helps – especially with speed. no need to skip 4 turns like with a witch – you can just constantly press forward renewing the buff every 3rd turn. Still up to this day i Rather take druid for tbs like Journey home – most of the damage is physical there and for those snakes teh extra buff is nice. Btw for cannon main – mounts and stuff arent the deciding factor even without the main is incomparably better than the mercs – but that extra lets say 2k attack does indeed helps with last hitting. saves you a buff or something…. mean to say for this tbs ! I am not a huge fan of Mwindo. She is a glorified witch. She may be useful here as is a witch but to be honest: I haven’t tried her out in Flamethrower. Druid, oracle good choice for this tbs. i’m 130 use evil cannon +4 with seth will and beast soul make great damage to any monster. Strategy make all better, using Scroll of Judgement to destroy trap. copied all your strategy..,., and the Succes..!! thank you so much sir…!! i did it for my first time last night and i use your trap map for help thx. only got 1 trap activate. im Sword main and i did it with ora and sherrif. the only problem i got was that cata was destroy like 2 times but this was my 2nd run ever so i think i did very well.